The WIKA SF6-Purity Meter is a cost effective way to determine if the SF6 percentage in SF6-filled equipment meets the requirements. Tolerable limits are suggested by the cigré SF6-Recycling Guide and the IEC 60480 for used gas. 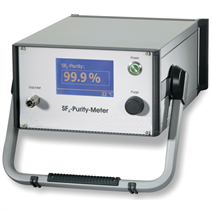 Measuring the SF6-concentration the SF6-Purity-Meter indirectly measures impurities of the tested SF6-gas like air and CF4. The SF6-Purity-Meter is a stand-alone device designed to quickly and accurately measure the percentage of SF6 present within the tested gas. Test gases also can be mixtures of SF6 e.g. SF6/N2. Because the unit has automatic flow and pressure control, the user does not need to be concerned with the correct flow rate settings or compensating for pressure variations in the equipment. The reading is temperature compensated and displayed in per cent (%) on the touch-screen display. With an optional Recovery Kit GA45 connected to the outlet valve of the purity-meter the tested gas is stored for possible reuse after positive test result.